Each influencer is not of equal value to all brands. Influencer Performance Heatmaps help you compare how an influencer is performing when talking about different brands or topics so you know who is most effective on a given conversation and who to work with on a given initiative. 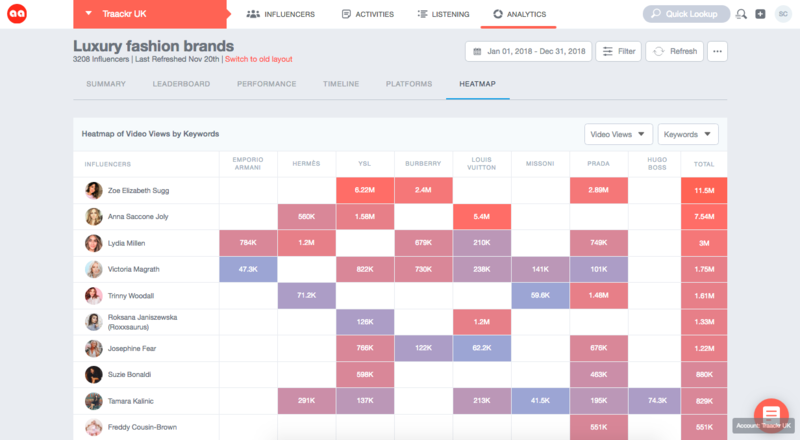 Influencer Performance Heatmaps give you a detailed view into each influencer’s performance for any brand or keyword across major social channels. You can compare the performance of each influencer across multiple brands and analyze how effective they are in promoting the message. What type of information is available in the Influencer Performance Heatmap? What are some ways I can use the Heatmap? Analyze influencers by topic to go beyond brand mentions to understand which ones are influential about a topic, what kind of content they’re creating, how audiences respond. Then prioritize those influencers when considering partnerships or activations.